Several European Union (EU) Member States recently participated in a simulation exercise aimed at analysing practices related to the implementation of the EU Dual-Use Export Control Regulation and identifying related challenges. The simulation gathered both Customs and licensing officers – all export control specialists – and reproduced real processes as far as possible, with Customs services controlling exports and licensing officers processing export licences. This article presents the rationale behind the exercise and the organizational set-up required, as well as the results obtained. Dual-use items are goods, software and technology normally used for civilian purposes, but which may have military applications, or contribute to the proliferation of weapons of mass destruction (WMD). Export control is essentially about putting State authorities in control of transfers of listed strategic items and related technologies through a licensing process. The EU has a unified Regulation for the control of dual-use items – the regulation in force being the EU Dual-Use Regulation 428/2009, as amended by Regulation 1382/2014 – which sets out the licence requirements for the export, transfer, brokering and transit of listed dual-use items. It combines, in an organized manner, the different international control lists relating to WMDs. The Regulation aims at mitigating the risk of WMD proliferation, facilitating legitimate trade and preventing unfair competition between EU Member States. The Regulation is common to all Member States. However, the licensing process – often handled by ministries of trade or economics – and the enforcement of the Regulation – mainly by Customs services – is the responsibility of each individual Member State. In this configuration, excellence, cooperation and harmonization of national export control systems across the EU are essential. Close understanding and cooperation between Customs and licensing officers are also required, although not a given in dealing with this challenging topic. Training and exercises are seen as being instrumental in reaching these objectives and building export control capacity in the EU, but there is still a need for more to be done in this area. To address this need, the Nuclear Security Unit of the Joint Research Centre (JRC) – the European Commission’s in-house science service tasked with carrying out research in order to provide independent scientific advice and support to EU policy – together with the European Commission’s Directorates-General for Taxation and Customs Union (DG TAXUD) and for Trade (DG TRADE), decided to design a tailor-made export control simulation exercise, known as SimEX, involving the relevant authorities of EU Member States. Draw lessons learned for future SimEX exercises, and what could be a more ambitious EU export control capacity building plan. As part of the exercise, two ‘fictitious states’ were created, each having two playing teams: one representing Customs and the other a licensing agency. In addition to the four playing teams, a master team was set up, charged with monitoring and driving the exercise while constantly adapting to the choices and requests made by the ‘fictitious agencies.’ The master team played 13 roles that included different stakeholders in the system, other than Customs and licensing, such as an intelligence service, the private sector and advanced technical reach-back, and certain internal functions, such as archive clerks and web search clerks of the licensing and Customs services. Seventeen participants from 13 Member States took part in the experiment: 11 Customs officers from Austria, Croatia, Denmark, Finland, Hungary, Italy, Lithuania, the Netherlands, Portugal and Slovenia; and six licensing officers from Belgium, Denmark, Hungary, Latvia, Malta and Portugal. These officers – all export control specialists – were placed within one of the four country teams or within the master team. 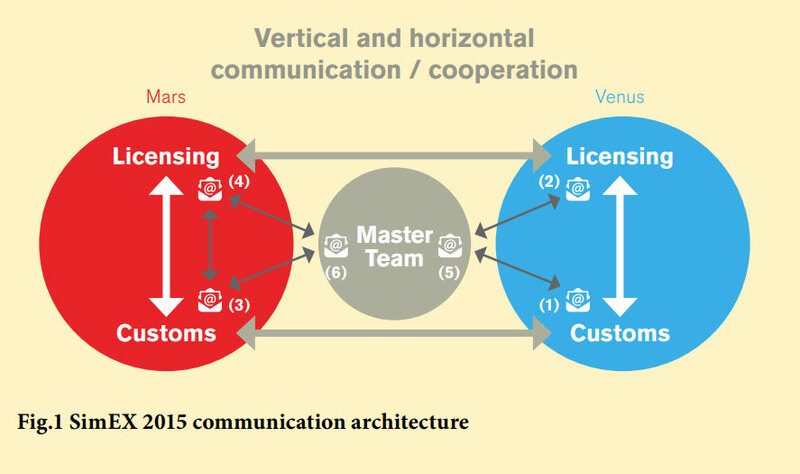 The simulation reproduced real processes as far as possible: Customs services controlling exports; and licensing officers processing export licences. The focus was the risk of diversion rather than specific destinations. The exercise required significant effort from the organizations involved in the preparation, and in particular from the five experts provided by Member States (Hungary, Italy, Malta, Portugal and Slovenia), the two JRC experts, as well as Customs policy experts from DG TAXUD. The preparation workload for Member States’ experts was minimized by outsourcing some of the time-consuming work, such as the creation of simulation documents and fictitious entities, based on guidance and instructions provided by the preparation team. 250 documents, 11 export licence applications and 200 Customs declarations were created with the technical support of Kings College London in the United Kingdom. 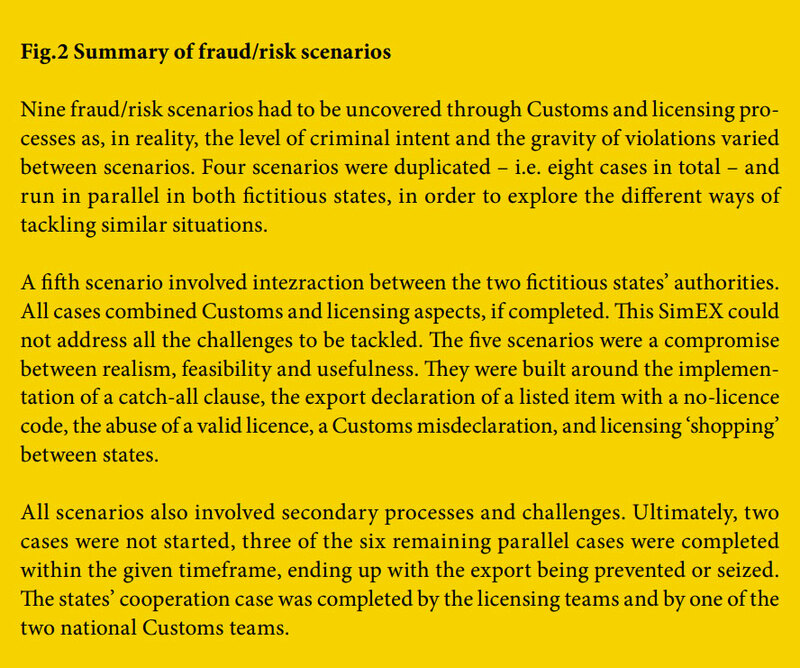 Nine elaborate fraud/risk scenarios were created, including a background story, an expected export control scenario, and a mapping of the complex export control process. Moreover, during the exercise itself, over 280 emails were sent by the different teams, and a significant number of documents were modified or created ‘on the fly’ by the master team (see Fig. 1 for the general communication architecture). The exercise was much more elaborate and complex than practical exercises which are usually run at export control capacity building events. Preparing and running it was not without its challenges. Amongst them were the need to maintain the quality of simulated documents, despite their quantity; the amount of background to build for each scenario, including the legitimate trade ‘noise’ produced; managing the complexity of interactions between the teams; preparing contingency plans to refocus activities if they excessively drifted from the backbone scenarios, and maintaining the right rhythm of work across the teams, despite partially unpredictable team decisions. In an initial ‘warm up’ phase, the Customs teams were requested to build initial risk profiles to target risky shipments, and the licensing teams were requested to decide on their export licensing policy – for example, a catch-all clause. The teams then started the simulation, triggered by various types of realistic initial inputs – selection of export declarations, intelligence reports, licence applications, discoveries in the field, etc. 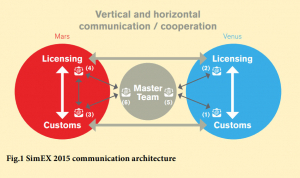 – and driven by interaction with other teams and the master team. Throughout the exercise, the participants discussed possible ways of proceeding, compared national practices, and used cooperation mechanisms to prevent illicit trade while preserving legitimate trade. The debriefing of the different cases showed that different teams took different paths to handle similar situations. In particular, questions of whom to inform, about what, when, and how to do it, were the subject of extensive discussion within teams and between teams. Some challenges specific to the EU context were highlighted and possible solutions discussed. Not all cases could be concluded as envisaged (see Fig. 2), but all triggered the expected discussions and exchanges. 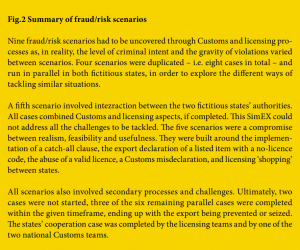 Nine fraud/risk scenarios had to be uncovered through Customs and licensing processes as, in reality, the level of criminal intent and the gravity of violations varied between scenarios. Four scenarios were duplicated – i.e. eight cases in total – and run in parallel in both fictitious states, in order to explore the different ways of tackling similar situations. A fifth scenario involved interaction between the two fictitious states’ authorities. All cases combined Customs and licensing aspects, if completed. This SimEX could not address all the challenges to be tackled. The five scenarios were a compromise between realism, feasibility and usefulness. They were built around the implementation of a catch-all clause, the export declaration of a listed item with a no-licence code, the abuse of a valid licence, a Customs misdeclaration, and licensing ‘shopping’ between states. All scenarios also involved secondary processes and challenges. Ultimately, two cases were not started, three of the six remaining parallel cases were completed within the given timeframe, ending up with the export being prevented or seized. The states’ cooperation case was completed by the licensing teams and by one of the two national Customs teams. The purpose of SimEX 2015 was not to teach that a particular way of implementing export control would be better than another. All participants in the preparation/master team and in the playing teams were experienced export control experts. The aim was to collectively reach the five objectives stated earlier. An anonymous electronic poll on the perceived level of achievement showed that all of the five objectives were seen as partially or completely achieved, with ‘completely achieved’ reaching scores between 53% and 89%. SimEX 2015 produced a wealth of lessons learned and suggestions for future exercises, export control capacity building and actual tools and processes used for strategic trade controls. The opportunity for professionals of different national and professional communities to work together on tackling export control issues was seen as rare and very useful. Many lessons learned relate to the design and organization of SimEX, including more time for discussions on the topics encountered during the simulation. The participants outlined the continuous need for capacity building and training on both the licensing and Customs side. Such efforts should include basic training for non-specialized Customs officers and advanced training on specific topics – technical or process-related – for specialized Customs and licensing officers. Interestingly, Customs officers were more interested in the technical aspects, such as controlled commodities specifications, than the licensing participants. Indeed, in a number of participating Member States, processes allow licensing officers to systematically reach-back to specialized technical experts, whereas Customs officers, under time pressure, often needed to make first level technical determinations themselves. Debriefing discussions also touched on how to improve tools, communication systems and cooperation practices. A general consensus was found on the need to renew and improve the SimEX experience. The JRC, DG TAXUD and DG TRADE have agreed to explore ways to repeat the SimEX experience, expand EU in-reach capacity building activities and build on lessons learned about export control implementation. Several participants have already indicated that they will encourage their national authorities to support the initiative. The SimEX experience also raised the interest of external organizations, including the WCO and the United States Department of Energy, and was recognized as an innovative exercise, complementing other international cooperation and training initiatives. It proved to be a powerful means to foster necessary mutual understanding, enhance cooperation, identify challenges, and exchange best practices between export control stakeholders around export control processes. It complements commodity identification trainings and other training curricula, such as the ones foreseen by the WCO, as well as coordinated operations like the WCO’s Operation Cosmo to detect and prevent the illicit trafficking of strategic goods in international supply chains. With the experience gained, the SimEX concept could be usefully adapted to other situations where control processes must accommodate trade facilitation, and different work communities must learn to cooperate. Such cases include dual-use trade controls between countries granting each other licence exemptions and global licences, and chemical, biological, radiological and nuclear (CBRN) border detection and response by frontline officers.